When I was a classroom teacher, my philosophy for my students was “memorize as little as possible.” That may sound shocking if you are of the opinion that kids need to memorize all sorts of math facts and formulas to be successful, but it’s what my high school calculus teacher taught us, and it’s how I successfully earned a college degree in mathematics. Now, that is not to say that nothing needs to be memorized. There are a handful of things mathematicians do need to know and remember, and today I’m going to focus on one such formula: The Pythagorean Theorem. 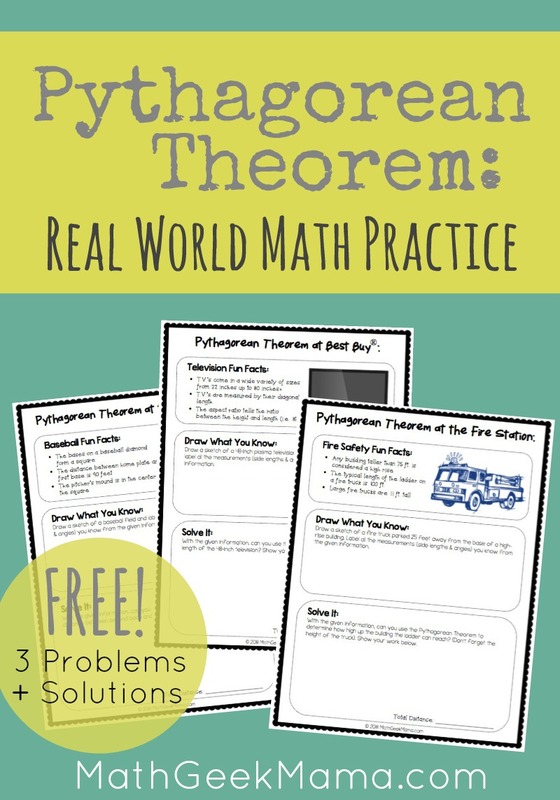 So read on to learn more about it and then grab the free set of Pythagorean Theorem Practice Pages, which will help your kids see the relevance of it! actually understanding what that means and applying it to solve problems is quite a different matter. To solve problems using Pythagorean Theorem, kids will need to understand squaring numbers and finding square roots. They also need to understand what a right triangle is and how to evaluate and solve equations. But even if you give kids all the necessary numbers and show them step by step how to solve an equation using Pythagorean Theorem, it will just be a bunch of meaningless numbers to them. It will seem like a pointless exercise, where once again math is completely irrelevant to their everyday life. We don’t want kids to feel that way, though! Especially not about a fundamentally important and useful theorem such as this. To fight against this notion, I’ve created a simple set of problems that give kids practice with the Pythagorean Theorem, but more importantly show them why this theorem is beautiful and necessary. We can use the Pythagorean Theorem to find lengths and distances of all sorts of questions in our everyday life. And when we show kids that it is relevant, then practicing the Pythagorean Theorem will not feel pointless and boring! 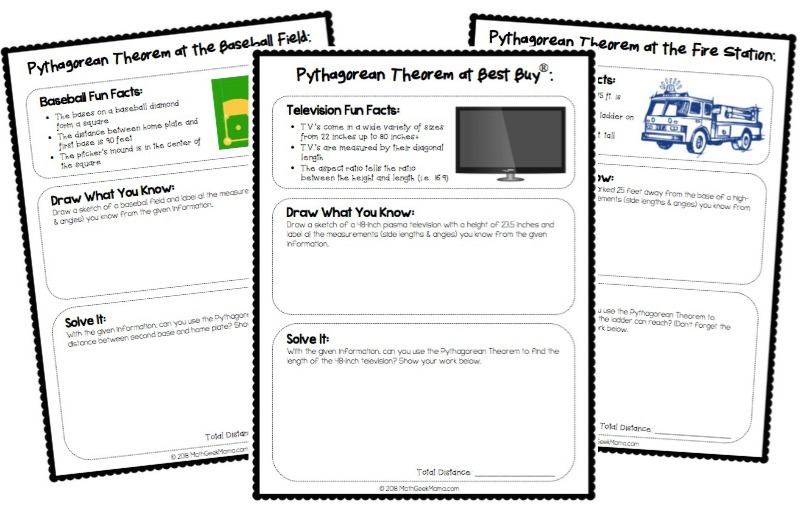 This set of Pythagorean Theorem practice pages includes 3 problems for kids to visualize, think about and solve using the theorem. The first discusses the layout of a baseball diamond, and challenges kids to find the distance from second base to home. Kids who love baseball will enjoy this challenge, and it will hopefully spark other math questions for them as they consider a game of baseball! The next problem is about television sets. This is important for anyone wanting to make the right decision about which t.v. to buy, because you need to know if it will fit in the space that you have. In this problem, kids learn that t.v.’s are measured by their diagonal, and have to find the length of a given television set. Finally, there is a slightly more challenging problem, which will really require kids to think about the whole situation. This problem involves a firetruck with a ladder of only 100 feet long. Because the truck is parked 25 feet away from the building, they have to determine how high the ladder can actually reach. Although this is often shocking and concerning news to people, there are other fire safety precautions in place, making those very high condos perfectly safe in the event of a fire. Each problem in this download includes a one page snapshot for kids to learn and solve the problem. It starts with relevant and interesting facts. They may or may not need these as they solve the problem. In the middle section, kids draw a sketch of the situation and label all the measurements. It’s important for kids to see a picture of what they’re thinking about so they know where the right angle is, and therefore what side is the hypotenuse. Finally, in the bottom space kids write out an equation and solve it to answer the given question. Depending on your kids and your situation, you could put kids into 3 small groups and let them work together to solve one of these problems. Or you could assign everyone the same problem and let them work on it individually (in class or at home). But I would certainly pick at least one of the problems to discuss as a class. Take time to draw a sketch of the situation. Then have kids label everything they know. Finally, ask kids how the Pythagorean Theorem helped them to solve the problem. Another fun way to explore this theorem is to challenge kids to prove it. This might seem daunting to you, or above the ability of your students, but it’s really quite doable when you use geometry. Further explaining and visualizing the theorem will help kids not only remember it, but deepen their understanding of it. 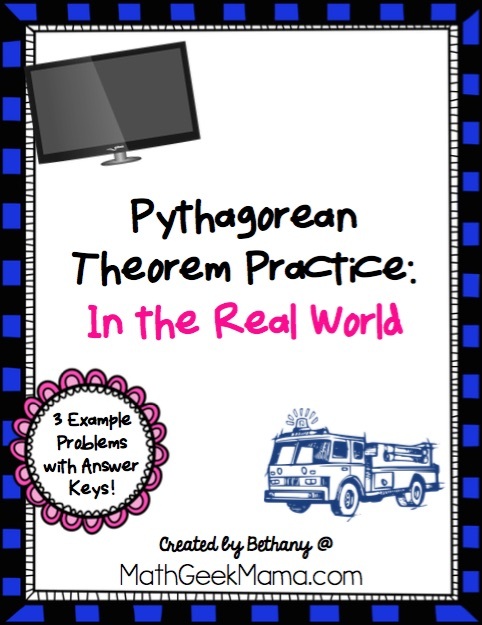 Find a quick and easy way to prove Pythagorean Theorem in this post. And of course, enjoy exploring math in the real world with this problem set! When your kids are finished and confident, challenge them to create their own example problem using the Pythagorean Theorem!